Volunteers will be working on maintaining healthy, beautiful, forest grounds for the Pacific Bonsai Museum: an open-air museum. The campus, in which the museum sits, is used as a site of natural recreation and exercise by the general public from the surrounding communities. The Museum is responsible for maintaining a portion of the campus grounds. In order for the museum to continue to be open to the public with free admission by donation, it must rely on the help of volunteers for maintenance. Therefore, the volunteers’ work will contribute to providing much needed cultural experiences in a diverse and underserved area that does not yet have a highly concentrated arts community. 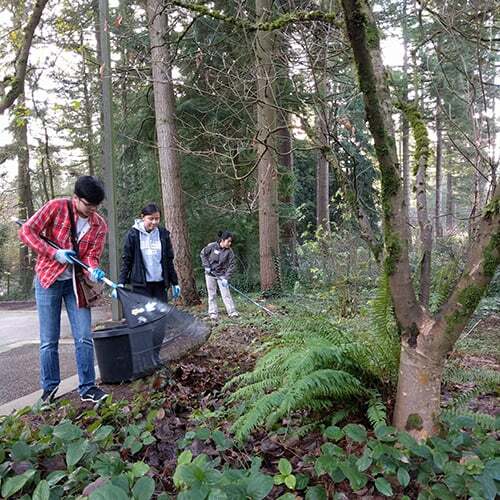 Volunteers will be doing valuable and much-needed jobs like raking, clearing forest debris, pulling weeds, and clearing fallen needles from the bonsai exhibits, etc. No particular skills are needed for this work—just a willingness to help, to move around, to bend and lift light loads. Clothing should be appropriate for being outside in the weather (i.e. cold, rain) for several hours. If parents would like to bring children, older kids who can help and don’t need a lot of supervision are welcome. The Museum will offer snacks, coffee, and other beverages; volunteers should bring their own lunch if they would like to eat lunch on site. Tools and work gloves will be available for the volunteers to use and share; but if volunteers have their own gloves, rakes, pruners, and/or hand shovels, they can bring those.